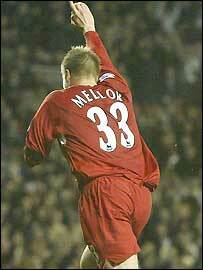 Neil Mellor scored with a blistering finish deep in injury time as Liverpool stunned Arsenal at Anfield. Xabi Alonso gave Liverpool the lead, drilling the ball home after collecting a superb pass from Steve Gerrard. Patrick Vieira equalised against the run of play after an hour, lifting the ball over Chris Kirkland to finish a superb flowing move. But with virtually the last kick of the game Mellor drilled the ball past Jens Lehmann from 25 yards.